Design of Hybrid Molecules for Drug Development reviews the principles, advantages, and limitations involved with designing these groundbreaking compounds. Beginning with an introduction to hybrid molecule design and background as to their need, the book goes on to explore a range of important hybrids, with hybrids containing natural products, molecules containing NO- and H2S-donors, dual-acting compounds acting as receptor ligands and enzyme inhibitors, and the design of photoresponsive drugs all discussed. 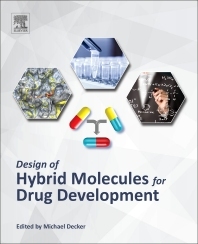 Drawing on practical case studies, the hybridization of molecules for development as treatments for a number of key diseases is then outlined, including the design of hybrids for Alzheimer's, cancer, and malaria. With its cutting-edge reviews of breaking developments in this exciting field, the book offers a novel approach for all those working in the design, development, and administration of drugs for a range of debilitating disorders. 6. Multitarget Anti-Alzheimer Hybrid Compounds: Do They Work In Vivo? Following a number of years as a medicinal chemistry lecturer and research scientist at institutes including Regensburg University Germany, Queens University Belfast UK, and Harvard Medical School USA, Michael Decker is currently Professor of Pharmaceutical and Medicinal Chemistry at the University Würzburg’s Institute of Pharmacy and Food Chemistry. His predominant focus is on the design of novel therapeutic compounds for the treatment of Alzheimer’s disease, which has led his group to a particular interest in the design of hybrid molecules.